On April 10th Governor Mike Huckabee added Arkansas to the growing list of states with minimum wage levels above $5.15 an hour. With this act, a majority of Americans now live in states that have enacted wage minimums above the federal floor. 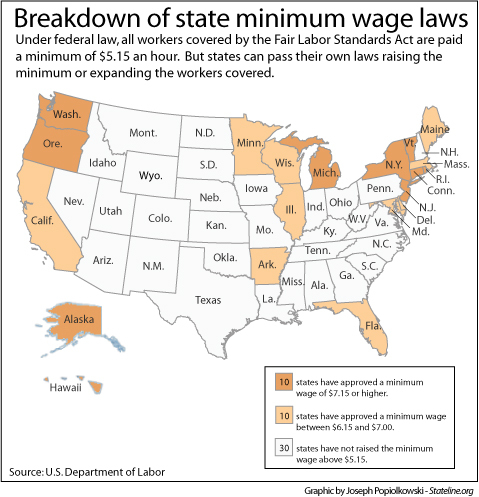 The political impetus behind this and other state actions is easily discerned – raising the minimum wage has broad public backing that crosses all social, regional and political categories. By an overwhelming margin (83% to 14%), the American public favors raising the federal minimum wage to $7.15 per hour — a hefty $2.00 an hour increase. And nearly half (49%) say they strongly support such an increase. While there are differences in the extent of support across political and socioeconomic lines, raising the minimum wage receives widespread support from both Republicans and Democrats, wealthy and poor. The federal minimum wage was last raised to the current $5.15-an-hour in 1997. However, 20 states plus the District of Columbia have passed legislation requiring employers to pay wages higher than the federal minimum. Already this year four states (Arkansas, Maryland, Michigan and Rhode Island) have committed to minimum wage increases. While state mandates differ, public opinion on the issue does not. In the 30 states where the federal $5.15 minimum applies, 82% say they support a $2-increase to $7.15, while just 16% are opposed. In states where a minimum wage of $7.15 or more has already been passed, 88% are in favor, a difference that is not statistically significant. Democrats express more support for minimum wage hikes, but the gap between Democrats and Republicans is relatively small in this era of intense partisanship. Raising the minimum wage by two dollars to $7.15 is nearly universally supported among Democrats – 91% favor the idea and just 8% are opposed. Independents agree by an 87%-to-11% margin. A larger proportion of Republicans (24%) opposes an increase to $7.15, yet still 72% are in favor. There is a somewhat greater party divide in intensity of support – Democrats are almost twice-as-likely as Republicans (59% vs. 31%) to strongly favor raising the minimum wage. But only 4% of Americans strongly oppose the idea, including 8% of Republicans and just 2% of Democrats. Not surprisingly, people in lower income brackets are more supportive of a hike in the minimum wage, but again, the idea garners broad support even among relatively wealthy Americans. Nine-in-ten people whose household income is under $20,000 annually support an increase to $7.15 an hour, while 7% are opposed. Among those with household incomes of $75,000 or more, 76% favor the idea, while 22% are opposed. Again, there is a significant gap in the intensity of feeling across these groups – 58% in the under-$20,000 category strongly support the $2.00 increase in the minimum wage, compared with 39% in the $75,000-plus category. When it comes to raising the minimum wage, opinions differ little across age groups, and there is no significant difference of opinion based on where a person lives. Support is roughly equal in urban, rural, and suburban parts of the country, and is equally as strong in the South, Midwest, Northeast and West. There is also broad support for a minimum wage hike across racial and ethnic lines – it is backed by more than eight-in-ten white, black and Hispanic respondents. Support is strongest among African-Americans, nearly two-thirds of whom strongly favor raising the minimum wage, compared with 47% of whites. Support for a hike in the minimum wage has grown somewhat over the past decade, though it has always been high. When asked about a more modest increase in the minimum wage from $5.15 to $6.45 an hour, 86% are supportive today. This is up from 80% who favored a hike to $6.15 in February of 1998. Opposition to a more modest increase in the minimum wage has fallen from 19% to 11% over this time period. 1See Stateline.org: Kathleen Hunter, “States lead way on minimum wage hikes,” Jan. 20, 2006. The National Restaurant Association compiles up-to-date information on state minimum wage laws. 2See: Mark K. Matthews, Wages, gay marriage could tilt ’06 ballots,” Stateline.org, March 20, 2006.